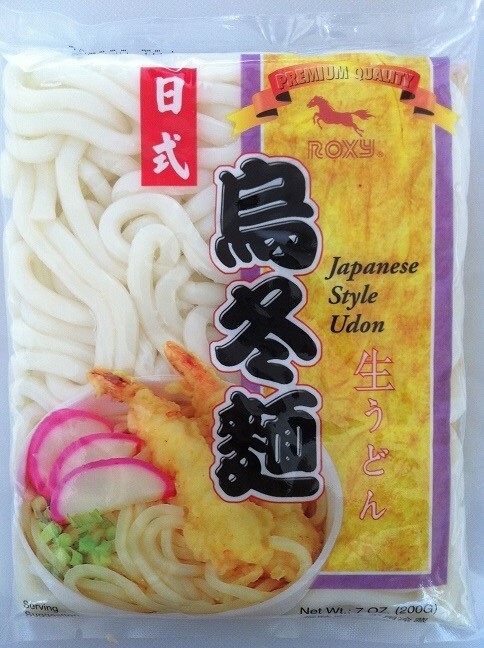 Today I want to introduce another type of Japanese noodles: udon. Have you ever had udon? I love anything that includes noodles. 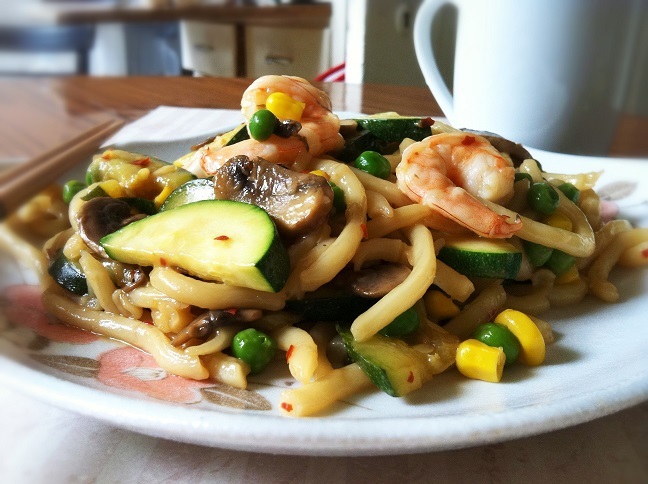 It doesn’t matter whether it’s noodle soup, stir fry noodles, pan fried noodles, or noodle salad. If they include noodles, I don’t need further convincing. 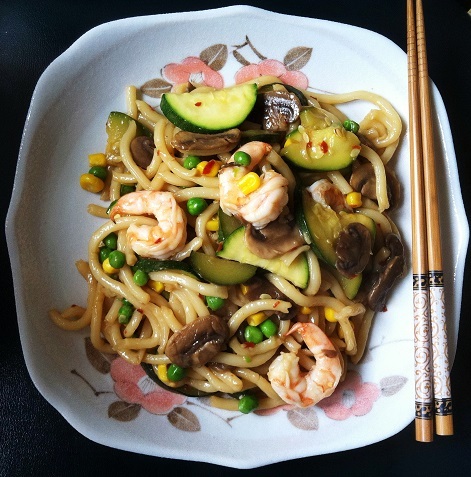 This udon dish is so very delicious with the classic taste of teriyaki sauce and filled with tons of vegetables, mushrooms, and shrimp! All of my favorite ingredients! First, add about a tablespoon of vegetable oil to a medium sized skillet. Allow the oil to heat for a minute. Then add mushrooms. 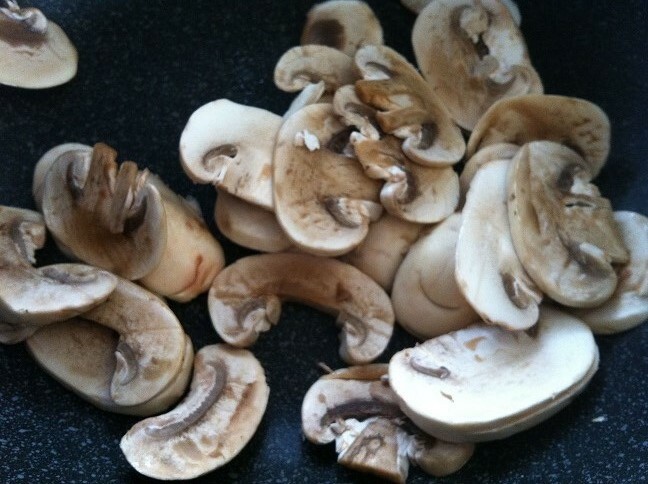 Use a spatula to stir the mushrooms and cook them evenly. 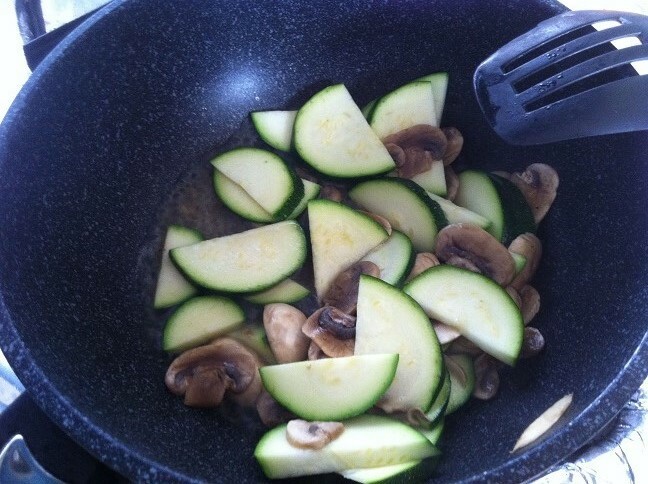 Once the mushrooms have softened, add in the zucchini and about ¼ cup water. The reason why I added the water is because the bottom of the skillet is too dry. Without liquid, our ingredients could become burnt. So I remedy that by adding a little bit water after each ingredient. 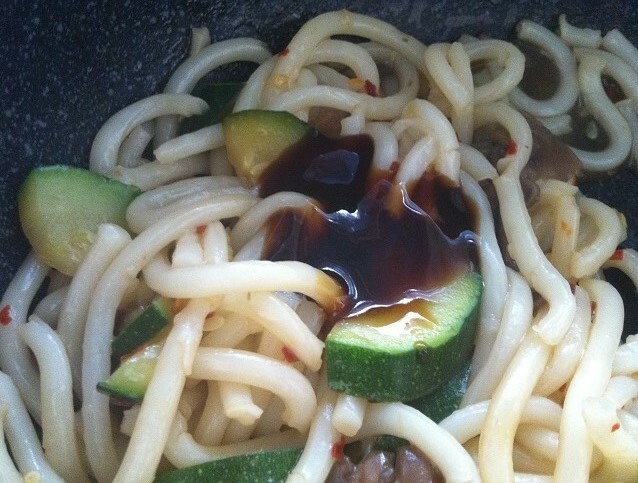 As the zucchini starts to soften, add in the udon noodles and ¼ cup water. You have two options. You can add the udon directly to the skillet. Or you can cook the udon separately in a small pot. 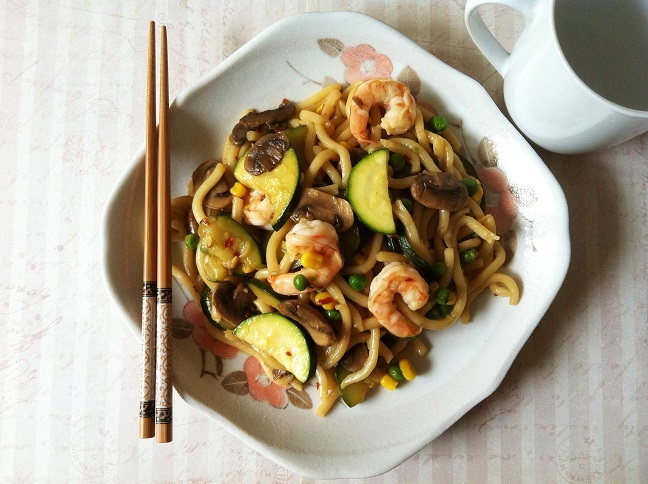 By cooking the udon a little bit, it will help soften and loosen the noodles instead of having them clumped together. Either way works. Add in the corn kernels and peas. Stir until all the ingredients are incorporated. Now, add in the teriyaki sauce, sugar, and water. If you like, add in crushed red peppers for spiciness. Stir the sauce until it coats the noodles and the vegetables. I used teriyaki baste and glaze, which was what I had on hand. 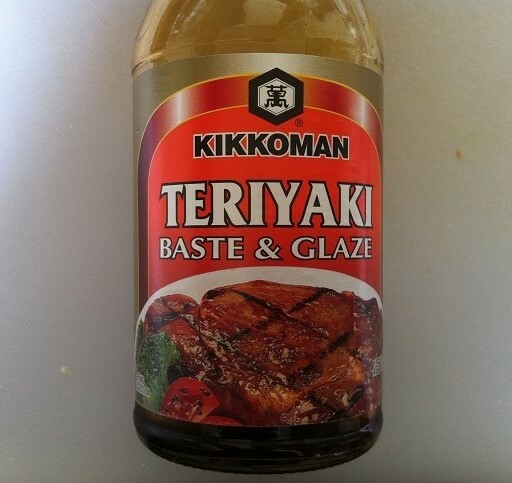 It has the same flavor as the teriyaki sauce and marinade, just thicker. You can use the marinade and sauce if that’s what you have. It should have the same flavor. I added the sugar to decrease the saltiness of the teriyaki. If you feel you need more sauce, you can add more to taste. At the end, add in the shrimp and cook them until they become red orange in color and no longer appear orange and translucent. Plate the udon, and serve the udon warm. Enjoy! I’m lovin’ your blog Andrea! Thank you so much, Poppy! Yum. I think I’ll have to try this! Aim to try it soon! Thanks…. Great idea for a quick and easy meal! 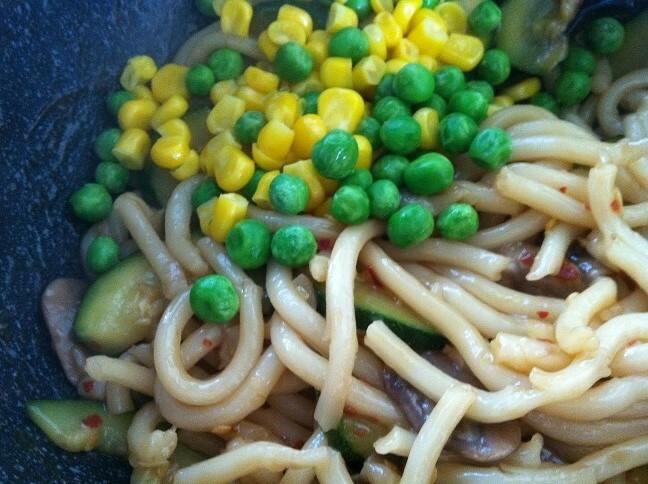 We make simple stir fry dishes like this a lot, using udon and whatever veg/sauce we have on hand. 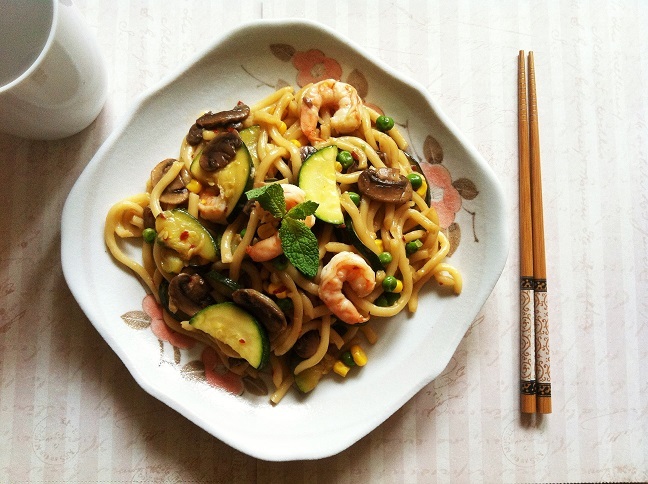 Love those soft, chewy udon noodles! I love this dish, something I will order for a quick meal at a Japanese restaurant. Have a good weekend, Andrea. This looks great – and I love all the summer-y colors in the dish. Great recipe! Your recipes are great and presented in a very appealing way. 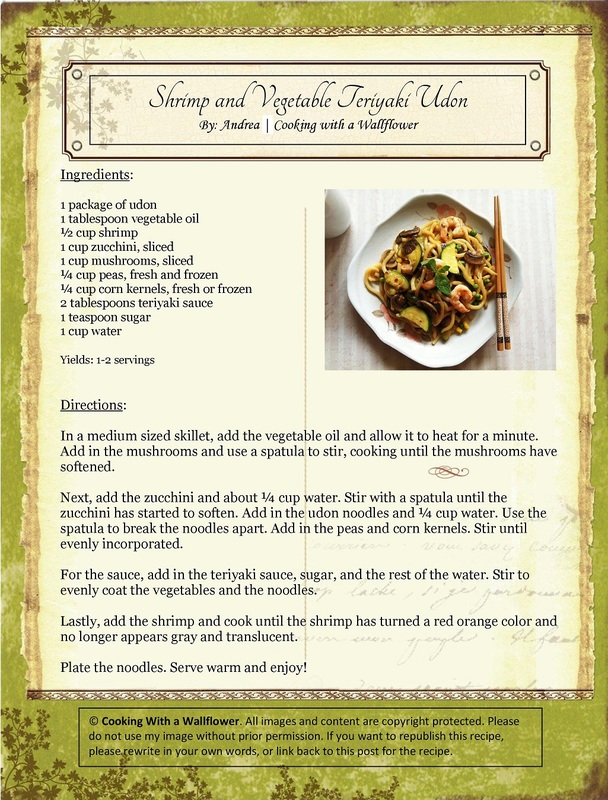 This is now the second recipe that I am bound to try out. The first one was a cauliflower recipe that I’ve seen recently on your site. 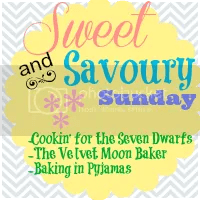 So, I will come back to your blog and check those and other recipes out. Keep up your great work! Oh my gosh, this looks so good! I love udon noodles! I just got really hungry. 🙂 Looks great!! Yum, Andrea! That really looks appetizing. 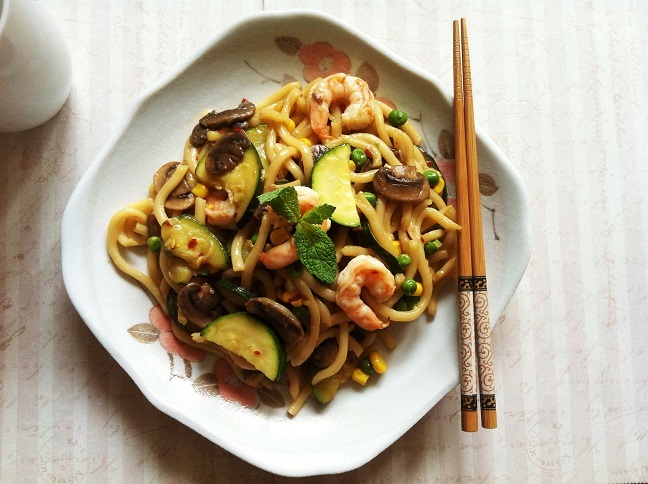 I need to replenish my supply of udon so I can make this! You keep cooking with shrimp and it is making hungry! I really must get to the store soon to buy some! Another ont to add to the Pinterest recipes to try folder. Need to wait until Hubby is out to try this one though as unfortunately he doesn’t like courgette or peas. Boo hiss! Your blog is amazing!!! Please feel free to check my blog out. It’s brand new and I’m excited to start seeing some progress! Your recipes always look delicious and are simply to make. Thanks, love your blog. Simple and nice. Going to try this for sure.